NZTCA members view a custom-made brush unit used to clean feijoas and a sorter which uses weight to size and direct feijoas into four different off-ramps and collection crates. 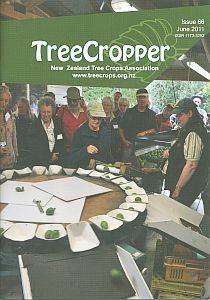 This sorter was demonstrated during a field trip to Ray and Jean Hollis’s Kapiti Gold Organics feijoa orchard in Te Horo during the 2009 NZTCA Annual Conference. Top left: The tree care and labelling at Guthrie Smith Arboretum was impressive. Top right: Management Committee: Andrew and Jennifer Hutson, Murray Redpath, Colleen Brown, Sjef Lamers and Gordon Lees. 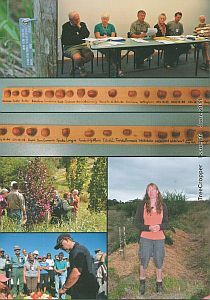 Hazel varieties displayed by Wairata Hazels. Jo Duff with a water-conserving swale behind her. Post-conference tour at Guthrie Smith Arboretum. Apple tasting of Jazz at Plant and Food Research Centre.